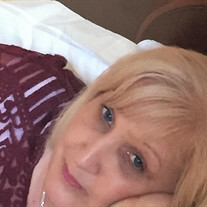 Penni Elizabeth Ward, age 53 of Rutledge, passed away Friday, July 27, 2018, at Parkwest Medical Center in Knoxville. She was a LPN, and worked as a care manager for Humana Insurance. She was preceded in death by her parents David and Barbara (Fender) Fuller; a daughter Erica Crabtree; and a brother Ricky Fuller. She is survived by her loving husband Greg Ward of Rutledge; sons Trey Crabtree, and Kevin (Ashley) Crabtree; daughter Makaila Gambrell; brother David Fuller; and sister Terrie (Jeff) Scalf. Visitation will be held from 6:00 to 8:00 pm on Monday, July 30, 2018, at Smith-Reagan Funeral Home in Rutledge, with funeral services following with Rev. Cliff Adkins officiating. Interment will be held at 11:00 am on Wednesday, August 1, 2018, in Roselawn Memory Gardens in Johnson City. In lieu of flowers, the family suggests memorials to St. Jude's Children's Hospital.